dch requested changes to D19912: lang/elixir: upgrade to 1.8.1 with lang/erlang 21.
dch added inline comments to D19912: lang/elixir: upgrade to 1.8.1 with lang/erlang 21.
dch added reviewers for D19192: lang/elixir: update to 1.8.1 and use OTP-21 shim: jrm, lwhsu, olgeni, feld. hey folks, this is a much simpler patch than Mark's earlier one and it's been working fine for me. Let's ship it if there's no complaints. I will amend the absolute path noted above. dch requested changes to D18324: Add OTP 21 for lang/elixir. Proposing we drop this in favour of Jimmy's git-based work for OTP itself, and my simpler shim for elixir at https://reviews.freebsd.org/D18324. Feedback hasn't been forthcoming yet Mark so please speak up on the 2nd patch if needed. Thanks! dch committed rP497788: databases/couchdb2: add DISTVERSION lost from arc patch in r497329. dch closed D19777: databases/couchdb2: DISTVERSION was lost from arc patch when committed in r497329. dch created D19777: databases/couchdb2: DISTVERSION was lost from arc patch when committed in r497329. dch committed rP497329: databases/couchdb2: update to 2.3.1.
dch closed D19621: databases/couchdb2: update to 2.3.1.
dch accepted D19644: lang/erlang-runtime21: switch to GitHub build and update to 21.3.1..
dch abandoned D17685: abuse MAKE_ENV to force including security/openssl which is pinned at 1.0.2 and therefore still works..
dch accepted D19606: Use GitHub to build lang/erlang* ports. ship it - I think hipe and dialyzer will need some care for 22 but we don’t have to fix it right now. dch requested changes to D19606: Use GitHub to build lang/erlang* ports. minor tweaks to download sites. dch updated the diff for D17710: [new ports] net-mgmt/rubygem-riemann-client etc. : new dependent ports to get to riemann-tools. dch added a comment to D17710: [new ports] net-mgmt/rubygem-riemann-client etc. : new dependent ports to get to riemann-tools. dch updated the diff for D19621: databases/couchdb2: update to 2.3.1.
dch committed rP496210: lang/erlang-runtime21: repair broken port fetch. dch closed D19623: lang/erlang-runtime21: fix broken fetch by extending MASTER_SITES. dch added a comment to D19621: databases/couchdb2: update to 2.3.1.
dch updated the diff for D19623: lang/erlang-runtime21: fix broken fetch by extending MASTER_SITES. dch created D19623: lang/erlang-runtime21: fix broken fetch by extending MASTER_SITES. dch created D19621: databases/couchdb2: update to 2.3.1.
dch committed rP496134: lang/erlang-runtime21: update to 21.3.
dch closed D18820: update Erlang/OTP 21 to latest runtime. dch updated the summary of D18820: update Erlang/OTP 21 to latest runtime. dch added a comment to D18820: update Erlang/OTP 21 to latest runtime. Should LOCAL/olgeni also be removed? It was a quick check, so maybe I am missing something. dch updated the diff for D18820: update Erlang/OTP 21 to latest runtime. OTP releases faster than we do... 21.3 is the new hotness. dch updated the diff for D19429: net-p2p/libswift: support OpenSSL 1.1.1.
dch added inline comments to D19429: net-p2p/libswift: support OpenSSL 1.1.1.
dch abandoned D17684: net-p2p/libswift: unbreak builds on 12.x. dch committed rP494460: sysutils/DTraceToolkit: remove missing providers in FreeBSD 12.0.
dch closed D15879: sysutils/DTraceToolkit: remove missing providers in FreeBSD 12.0-CURRRENT. dch created D19429: net-p2p/libswift: support OpenSSL 1.1.1. I still see a fetching issue (after 12 hours). It looks like preloaded-21.2.6.tar.gz is only available from your account. Adding LOCAL/dch:local to MASTER_SITES allows it to fetch. dch added a reviewer for D18820: update Erlang/OTP 21 to latest runtime: feld. dch added a comment to D19080: lang/elixir: Update to 1.8.1.
dch created D19192: lang/elixir: update to 1.8.1 and use OTP-21 shim. dch requested changes to D19080: lang/elixir: Update to 1.8.1. @feld here's https://git.sr.ht/~dch/ports/commit/0af5618836ea22f68f8c4a0c183dee08c042375b alternative implementation using OTP21 via shim, much tidier IMO. I am not clear how to update LOCALBASE within the patch file though, what do you suggest for doing that rather than having it hardwired? dch added inline comments to D19080: lang/elixir: Update to 1.8.1.
submitted exp-run https://bugs.freebsd.org/bugzilla/show_bug.cgi?id=235733 for removing the older OTP versions. Once that's back I'll do one to bump default OTP to 21.2.5.
dch added a watcher for bhyve: dch. dch created D18820: update Erlang/OTP 21 to latest runtime. dch updated the diff for D18533: net/zerotier: wait for ONLINE status before booting. dch committed rP488025: databases/couchdb2: detach stdout from daemon invocation. dch committed rP487883: MFH: r487873. dch committed rP487870: Document databases/couchdb2 and databases/couchdb vulnerability. dch closed D18498: security/vuxml: add CVE for databases/couchdb2. dch changed the visibility for D18498: security/vuxml: add CVE for databases/couchdb2. dch closed D18597: databases/couchdb2: bump PORTREVISION after lang/erlang-runtime21 was updated. dch committed rP487873: databases/couchdb2: bump PORTREVISION after lang/erlang-runtime21 was updated. dch awarded D18578: OpenRC for FreeBSD a Party Time token. dch created D18597: databases/couchdb2: bump PORTREVISION after lang/erlang-runtime21 was updated. dch updated the diff for D17965: sysutils/graylog: update to 2.4.6.
dch added a comment to D18533: net/zerotier: wait for ONLINE status before booting. debugging things that early in the boot phase. dch created D18533: net/zerotier: wait for ONLINE status before booting. dch committed rP487158: MFH: r487151. dch created D18498: security/vuxml: add CVE for databases/couchdb2. dch committed rP487151: databases/couchdb2: update 2.2.0 -> 2.3.0.
dch closed D18409: databases/couchdb2: update to 2.3.0.
dch added a comment to D18409: databases/couchdb2: update to 2.3.0.
is why nobody noticed it prior. We’ll fix it for 2.3.1 though. dch retitled D18409: databases/couchdb2: update to 2.3.0 from databases/couchdb2: update to 2.3.0-RC1 to databases/couchdb2: update to 2.3.0.
dch created D18409: databases/couchdb2: update to 2.3.0.
dch closed D17939: net/rabbiteer: fix openssl 1.1.1 breakage - rabbiteer uses a library that uses a library that provides OpenSSL - amqp library is EWONTFIX so purge the OpenSSL patches until whenever. dch committed rP485293: net/rabbiteer: fix openssl 1.1.1 breakage. dch added a reviewer for D17965: sysutils/graylog: update to 2.4.6: jrm. the diff side of this is ready for review, but I still need to work through functional testing - actual conf is quite different to previous version. dch added a comment to D17939: net/rabbiteer: fix openssl 1.1.1 breakage - rabbiteer uses a library that uses a library that provides OpenSSL - amqp library is EWONTFIX so purge the OpenSSL patches until whenever. @jrm this passes local poudriere, needs your rubber stamp or your nit-stick. dch created D17965: sysutils/graylog: update to 2.4.6.
dch created D17964: devel/py-q: new port for python debugging. dch committed rP484800: sysutils/fwup: new port for managing embedded linux systems. dch closed D17907: NEW PORT: devel/fwup - like NanoBSD but for linux. dch added a comment to D17907: NEW PORT: devel/fwup - like NanoBSD but for linux. I'm now wondering if devel is the appropriate category. sysutils? dch created D17939: net/rabbiteer: fix openssl 1.1.1 breakage - rabbiteer uses a library that uses a library that provides OpenSSL - amqp library is EWONTFIX so purge the OpenSSL patches until whenever. dch updated the diff for D17907: NEW PORT: devel/fwup - like NanoBSD but for linux. dch created D17907: NEW PORT: devel/fwup - like NanoBSD but for linux. thanks, that sed goop works a treat. I'll doublecheck some more functionality tomorrow but I think this is ready to land now. dch committed rP484285: New port: sysutils/py-ansible-runner: programmable interface to ansible. 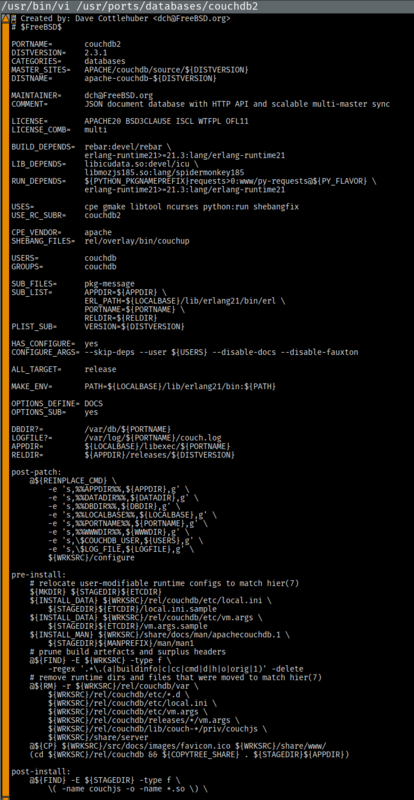 dch closed D17518: sysutils/py-ansible-runner: new port - programmable interface to ansible. dch added inline comments to D17710: [new ports] net-mgmt/rubygem-riemann-client etc. : new dependent ports to get to riemann-tools. dch created D17710: [new ports] net-mgmt/rubygem-riemann-client etc. : new dependent ports to get to riemann-tools. dch added a reviewer for D17685: abuse MAKE_ENV to force including security/openssl which is pinned at 1.0.2 and therefore still works. : danfe. dch added reviewers for D17685: abuse MAKE_ENV to force including security/openssl which is pinned at 1.0.2 and therefore still works. : jrm, swills. dch updated the diff for D17685: abuse MAKE_ENV to force including security/openssl which is pinned at 1.0.2 and therefore still works..
dch created D17685: abuse MAKE_ENV to force including security/openssl which is pinned at 1.0.2 and therefore still works..
dch added a comment to D17684: net-p2p/libswift: unbreak builds on 12.x. OK poudriere tells me this doesn't work. However I definitely got 1 good build earlier - need to investigate what I've missed. dch created D17684: net-p2p/libswift: unbreak builds on 12.x. dch updated the diff for D17518: sysutils/py-ansible-runner: new port - programmable interface to ansible. dch committed rP482876: new port: sysutils/py-packet-python: provides packet.net API wrapper. dch closed D17517: sysutils/py-packet-python: new port providing packet.net API wrapper in python.